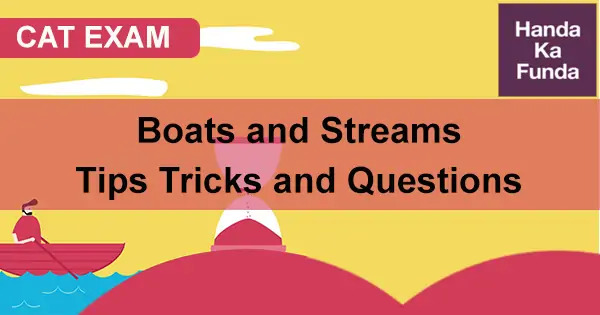 Boats and streams is one of the most common topics in quantitative section of all the entrance exams such as Bank PO, CAT, XAT, CLAT etc. It’s also included in aptitude section of many job test in companies like TCS, Infosys etc. This a very simple topic and mere require direct application of formulas to solve the question. However, many students find this topic confusing and find face difficulties in solving them. And, the reason for facing such hindrance is the understanding of the language of question. They are just Speed, Distance and Time questions in water rather with a slightly twisted language. In this blog, today I will provide you all the formulas and their application to make understand this concept and application so that the next time you get any question based on this topic in any exam it’s a smooth ride! First, I’ll explain you the few terms that you will generally find in all the questions and type of question that can come in exam. Upstream: It means that you are moving in opposite direction from that in which river flows. Downstream: It means moving along in the direction of the flow of the stream. Let the speed of boat be a km/hr. and speed of the stream be b km/ hr. Therefore, the relative speed of boat going upstream is (a-b) km/hr. and speed of the boat going downstream will be (a + b) km/hr. Still water: When the water is still and not moving and there’s no flow like that in case of ponds then it’s called still water. Then, the relative speed of boat in still water is ½ (a + b) km/hr. And, the speed of stream is ½ (a – b) km/hr. Time based question: In this kind, you will be given speed of the boat and stream in still water. You need to calculate the time to go upstream/ downstream. There can also be other questions in calculation of time and some of them can be easily be solved using the formulas given below. Example 1: The speed of a motor boat is that of the stream as 36:5. The boat goes along with the stream in 5 hours and 10 minutes. How much time will it take to come back? Sol) Let the speed of the motor boat and that of stream be 36x km/hr. and 5km/hr. respectively. Then, the speed downstream = (36x + 5x) = 41km/hr. Speed upstream = (36x – 5x) = 31 km/hr. Speed based question: In this kind, you will be given speed of boat upstream and downstream, you need to find the speed of still water and stream. Example 2: The speed of the boat when traveling downstream is 32 km/hr. whereas when traveling upstream it is 28 km/hr. What is the speed of the boat in still water and the speed of the stream? Sol) This question requires direct use of the formula mentioned earlier. Speed of the boat in still water = ½ (32 + 28) km/hr. = 30 km/hr. Speed of the stream = ½ (32 – 28) hm/hr. = 2 km/hr. Speed of the boat in still water = b (t2 + t1)/ (t2 – t1) km/hr. Example 3: A boat take 8 hours to cover a distance while traveling upstream, whereas while traveling downstream it takes 6 hours. If the speed of the current is 4 km/hr. What is the speed of the boat in still water? Speed of the boat in still water = 4(8+ 6)/ (8 – 6) = 4 * 14/2 = 28 km/hr. Example 4: A boat, while going downstream in a river covered a distance of 50 miles at an average speed of 60 miles per hour. While, returning because of water resistance, it took 1 hour 15 minutes to cover the same distance. What was the average speed during the whole journey? Upstream speed = distance covered in 1 hour 15 minutes / Time taken to travel 50 miles = 50/5/4 = 40 miles/hr. Boat’s speed in still water = ½ (Upstream speed + downstream speed) = ½ (40 + 60) = 50 miles/ hr. Now we are in stage of using the average speed formula. Average speed during whole journey = (40 * 60)/ 50 = 48 miles/ hr. Distance based question: In these kind, you have to calculate distance travelled by the boat when time, speed of still water and stream is given. There can be two different formulas to calculate the distance for two distant cases. Example 5: A person challenged himself to cross a small river and back. His speed of boat in still water is 3 km/hr. He calculated the speed of the river that day was 1 km/hr. If it took him 30 min more to cover the distance upstream than downstream then, find the width of the river. Sol) Here, width of the river is the distance, b is 1km/ hr. and time is 30 minutes. Example 6: A man can row 7 ½ km/hr. in still water. If in a river running at 1.5 km an hour, it takes him 50 minutes to row to a place and back, how far off is this place? Sol) To solve this question we will simply use the formula given above. In this case, t is 50 minutes b is 1.5 km/hr. and x is 7 ½ km/hr. The above examples are just few simple and basic application of the methods stated along with them. These formulas can come in handy and can save lot of your time in exam. You can find questions and problems involving simultaneous use of more than one formula at times. But if you know the correct utilization of them you can solve any problem easily. And, this smoothness comes with practice so the more you varied questions you try the more you will learn and become better at solving them. So, keep practicing!